Some more movie thoughts as I try to catch up with the big backlog of movies I’ve managed to build up while holding back the tears caused by the rumored Rafael Soriano for Horacio Ramirez trade. That’s the wrong Ramirez, dumbass! 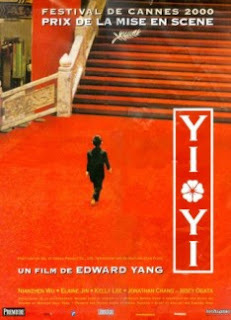 Yi Yi – Recently released in a beautiful Criterion DVD, Edward Yang’s novelistic film of a family in contemporary Taiwan is warm and humanistic where the very similar Short Cuts is cynical and misanthropic. Each member of the family has their own storyline: the father tries to bring some honor and art to the business he co-owns while his partners play games with the sole goal of making money, and he meets up with his first love, a woman he hasn’t seen in 30 years; the teenage daughter falls in love for the first time; the mother has a nervous breakdown and goes away for awhile; the young son gets in trouble at school and likes taking picture of the backs of people’s heads; the grandmother falls into a coma after the film’s opening wedding scene. A massive and profound film, one of the highlights of the great New Asian Cinema. The #4 film of 2000. House Of Usher – The first of the Roger Corman Edgar Allen Poe adaptations starring Vincent Price. It’s not nearly as successful as Masque Of The Red Death, in pretty much every way. The non-Price acting is pretty terrible, especially by Mark Damon, who plays the young man who finds himself caught up in the incestual/necrophiliac horrors of the Usher family. The ultra-low budget shows is the cheesy staginess of the production, whereas Masque had the benefit of using sets leftover from the big budget Becket. Still, Corman has a distinctive style and a good eye for color, and Price is always fun to watch. The #14 film of 1960. The Prestige – The latest Christopher Nolan film is also the second magic-themed movie of the season (I haven’t seen The Illusionist). Hugh Jackman and Christian Bale star as feuding magicians, who spend some period of years trying to top each other’s tricks to humiliate and revenge themselves on each other. The omnipresent Scarlett Johansson shows up as an alternating love interest, Michael Caine plays an older mentor-magician and David Bowie’s nearly unrecognizable as the inventor Nikola Tesla. Aside from a creditable amount of period detail, the film isn’t all that much to look at, and the story suffers from the fundamental flaw of all trick movies: once you figure out the trick, the movie’s not nearly as interesting. The unique problem this trick film has is that the audience figures everything out long before the characters themselves do, making the last 30 minutes or so nearly unbearable. Les Mistons and Antoine & Colette – Two short films by François Truffaut. Les Mistons is from 1957, two years before the New Wave hit it big with the Truffaut-scripted Breathless. It follows a group of delinquent boys as they torment a young couple in love (Gérard and Bernadette) over the course of a summer. At 17 minutes long, it’s a slight but interesting film, famous mostly for the icky sequence in which the boys sniff Bernadette’s bicycle seat. Eww. The #12 film of 1957. Antoine & Colette is part of the anthology film Love At Twenty, and a continuation of the autobiographical Antoine Doinel series Truffaut began with his debut film, The 400 Blows. Jean-Pierre Léaud reprises his role as Antoine, now a young adult with a job and no annoying parental units. He meets Colette, falls in love, takes her to concerts, even moves into the apartment across the street from her, but can’t ever manage to escape the friend ghetto. I haven’t seen any of the later Doinel movies, but I understand he becomes more successful at the whole romance thing. The #16 film of 1962. Faster, Pussycat! Kill! Kill! 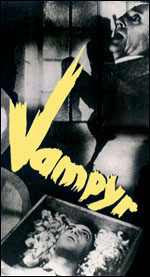 – Russ Meyer’s camp classic about a gang of three evil strippers who torment a young girl, kill her boyfriend and become caught up in a creepy family’s power struggles. The opening half hour, when the gang meets the square couple and have a nice friendly car race is by far the best part of the film. After that, the high intensity pitch of the film degenerates into a campy weirdness. There are some cool sequence in the rest of the film (a battle between a giant manly man and a car in particular), but it’s that first half hour that makes the film worth watching. The #9 film of 1965. Adam’s Rib -Reportedly the best of the Katherine Hepburn – Spencer Tracy films, though I’ve only seen the mediocre Guess Who’s Coming To Dinner and The pretty good Woman Of The Year. Tracy and Hepburn play married lawyers on opposite sides of a case in which a young wife shoots her husband when she catches him with another woman. The case metastasizes into a rumination on the merits of feminism, and quite nearly ends more than one marriage. Judy Holliday is terrific as the would-be murderer. Especially notable is a very long-take scene in which Hepburn talks to her client for the first time. Director George Cukor holds the two actresses in a two shot, at opposite sides of the frame and separated by a table for the entire sequence. The film also stars Tom Ewell (The Seven-Year Itch) as the unfaithful husband and Jean Hagen (Singin’ In The Rain) as the other woman. 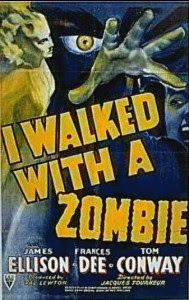 I Walked With A Zombie – The second of Jacques Tourneur’s horror films for producer Val Lewton is apparently a voodoo version of Jane Eyre. Since I’m totally Brontë-ignorant, I can’t say anything about that, but this is a superb noir-horror film. A young nurse comes to a small Caribbean island and becomes the object of conflict between the two white brothers who dominate the island. She’s there to take care of the wife of one of them, who the other one was in love with as well and who may or may not be a zombie. A zombie in the voodoo sense, not quite in the George Romero, must eat brain sense. Like in the previous Lewton-Tourneur collaboration, the great Cat People, the horror is more a function of psychology expressed through light, shadow, camera movement and general eerieness of mise-en-scène that the shock and gore of modern examples of the genre. The Leopard Man – The third Lewton-Tourneur film is a lot less successful than either of the previous two. Playing like a straight version of Bringing Up Baby, a hungry leopard is on the loose in a small New Mexican town and manages to kill a couple girls. The question is: who let the cat out? Not as interesting psychologically or visually as its predecessors, it still has some great moments, specifically the first cat attack (cattack?) and the finale set during a creepy holiday celebrating imperialist massacre, complete with black robes and masks. Seven Men From Now – The first of the low-budget Westerns directed by Budd Boetticher and starring Randolph Scott, and also the first one I’ve seen. Scott plays an ex-sheriff on a quest to kill the seven men who held up a bank and (accidentally) killed his wife. Along the way he helps a young married pioneer couple travel across the country (out-manlying the husband, naturally) and meets a couple of outlaws, led by Lee Marvin, playing his specialty: a cagey amoral nihilist. Psychologically complex in it’s study of revenge, the film would make a great double-feature with The Searchers. Shot in an existentialist Technicolor, with larger than life men struggling against vast, terrible landscapes. It’s too bad more Boetticher films aren’t available. Goodbye, Dragon Inn – A run-down movie theatre showing King Hu’s kung fu classic Dragon Inn is the setting for this very slow film by Taiwanese director Tsai Ming-liang. There’s no dialogue at all until about halfway through the film, instead there are a series of long shots of the few moviegoers watching (or more specifically not-watching) the movie, along with the box office attendant making her lunch, eating it, and limping her way very slowly around the theatre. None of the patrons seem especially interested in watching the movie; we spend a lot of time following around a young man looking to pick up a guy, any guy he can find and being totally unsuccessful. In the weirdest sequence of the film, he wanders through a backstage maze, walking past dozens of the apparent ghosts of all the random encounters in the theatre’s past. the films always teeters on the edge of boredom, but never quite falls off. Instead, it works as a loving tribute to the movie theatre culture, a lot more interesting than the vastly overrated Cinema Paradiso, for sure. The #4 film of 2003.